A $150,000 gift to UBC’s Okanagan campus is enabling a new funding resource that supports early career health researchers working with industry and communities. Established with an endowment from Ulco Visser — a Colorado educator, philanthropist, and president of the Impact Foundation — the Innovations in Wellness Fund will foster partnerships between industry and academia that tackle challenges spanning the complete spectrum of physical, mental, and social well-being. The Innovations in Wellness Fund’s unique model was jointly developed with the Faculty of Health and Social Development and Mitacs—a national, not-for-profit organization dedicated to research and training programs. Its multilayer funding model ensures Visser’s three-year gift will have maximum benefit to students, faculty, and the community. “Increased funding for graduate students and post-doctoral students are the short-term benefits of the funding model, and the long-term effects would ultimately be improved well-being in the community,” says Visser. Accepting its first applications in 2016, each research proposal will identify its alignment with the World Health Organization’s comprehensive characterization of health: a state of complete physical, mental and social well-being and not merely the absence of disease or infirmity. Improved well-being has characterized Visser’s relationship as a valued supporter of UBC Okanagan. In 2013, Visser donated $1.2 million to the campus to create a program of mindfulness. Visser decided the Faculty of Health and Social Development was ideally situated to further increase the impact of his gift on research excellence and infrastructure. The Faculty of Health and Social Development is committed to the long-term success of the Innovations in Wellness Fund, and looks forward to three years of increased support for its students, faculty, and community partners. 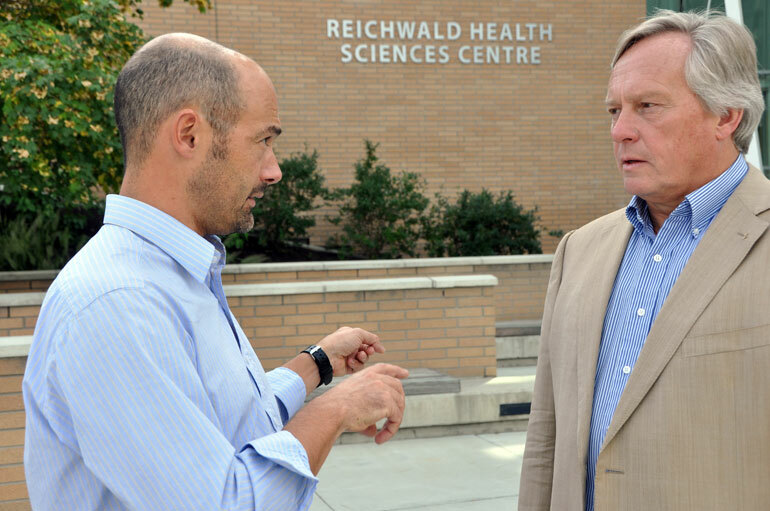 Dean of Faculty of Health and Social Development, Gordon Binsted (left) discusses health and wellness with Ulco Visser whose foundation just donated $150,000 to UBC Okanagan.